At the show I am finally revealing the Autumns on the Spey project Ive been working on for the past year. 16 patterns from the book tied by 16 great Tyers from all over the world. Very proud of the collection which is a combo of Art, culture and tradition, thes project enhanced by a set of Shanks flies discovered in Aberlour recently. If youre at the Stoke on Trentshow this weekend please come by and check it out. Well I made it. Bought an amazing limited edition print of 3 great Jock Scotts by Sarah. I love it, and it's going to look great on my wall. 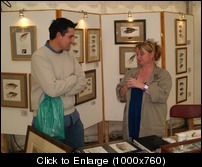 Great to meet you again Sarah, I enjoyed chatting to yourself and Andy. Anyone who doesn't already know, Sarah produces THE best fly art I've ever seen. Well worth a look at her web site. :-) Nice to meet you Colin thanks for coming by . You say the nicest things too.